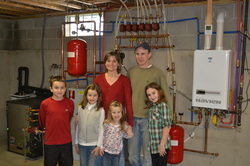 ACES-Energy is a certified installer and warranty repair company for Navien On-Demand Hot Water heaters. Our service vehicle is fully stocked with replacement components for the Navien instant hot water heaters. We also service other popular on-demand hot water heaters such as Rinnai, Rheem, AO Smith, State, Bosch and Takagi. In addition, we install and service residential and commercial traditional hot water heaters. We have the knowledge to assist in system design and selection from simple 2-person homes to commercial laundromats, hair salons and restaurants. Whether it be a simple leak, service tune-up or complete replacement, your ACES-Energy team is here to assist!